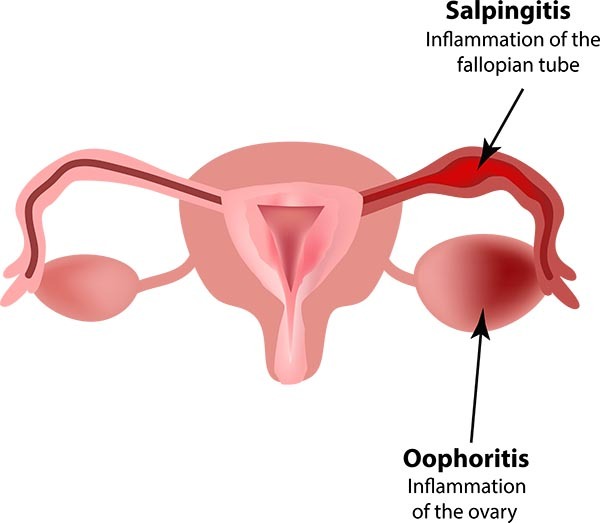 Pelvic inflammatory disease refers to acute and subclinical infection of the upper genital tract in women, involving any or all of the uterus, fallopian tubes, and ovaries; this is often accompanied by involvement of the neighboring pelvic organs. It results in endometritis, salpingitis, oophoritis, peritonitis, perihepatitis, and/or tubo-ovarian abscess. Pelvic inflammatory disease (PID) refers to acute and subclinical infection of the upper genital tract in women, involving any or all of the uterus, fallopian tubes, and ovaries; this is often accompanied by involvement of the neighboring pelvic organs. It results in endometritis, salpingitis, oophoritis, peritonitis, perihepatitis, and/or tubo-ovarian abscess. The majority of PID cases (85 percent) are caused by sexually transmitted pathogens or bacterial vaginosis-associated pathogens. Fewer than 15 percent of acute PID cases are not sexually transmitted and instead are associated with other bacteria that have colonized the lower genital tract. PID represents a spectrum of infection and there is no single diagnostic gold standard. Clinical diagnosis remains the most important practical approach. Treatment is predetermined and recognized by the Center for Disease Control and Prevention.